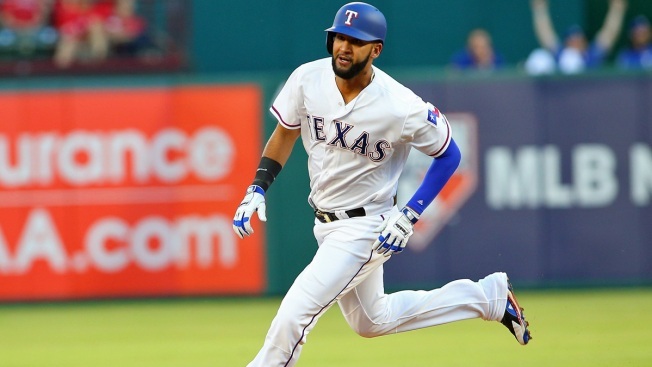 Nomar Mazara hit his first grand slam and had a career-high six RBIs to lead the Texas Rangers over the Oakland Athletics 10-5 Friday night for their first victory of the season. Mazara is hitting .588 through four games, including 3 for 5 in this one. Rougned Odor hit his third homer of the season and had two hits. Texas was swept by Cleveland in its three-game opening series, also at home. Alex Claudio (1-0) replaced starter A.J. Griffin in the fourth inning and held the A's to one hit over 3 2/3 scoreless innings. Griffin left with scrapes on his pitching palm and both knees after he slid on the warning track near the Oakland dugout trying to field an overthrow by Mazara from right field. Raul Alcantara (0-1) allowed eight runs and four hits -- including both homers -- over two innings. He also hit a batter in his sixth big league start. Mazara got his first RBI in the first inning when Yonder Alonso barely missed stepping on first base after fielding Mazara's ground ball, allowing Carlos Gomez to score from third. Mazara then homered to center in the second inning. Matt Joyce hit a three-run homer in the third after being robbed of a first-inning shot by Gomez in right-center in front of Texas' bullpen. Khris Davis' fourth-inning home run was his third of the season. Last year, Davis hit 10 homers off Texas pitchers. Griffin gave up four runs and four hits -- including two home runs -- plus two walks and a hit batter. Adrian Beltre, on the disabled list with right-calf tightness, turned 38 on Friday. ... The Rangers also began the 2016 season 1-3 before finishing with the league's best record for the first time in club history. ... Oakland's Jesse Hahn threw 79 pitches in six innings in his first appearance of the season. He was struck in the right foot by Shin-Soo Choo's broken-bat grounder in the fourth inning and was nearly hit in the left shoulder by the bat. Athletics: RHP Sonny Gray (lat strain) was pleased with Friday's 35-pitch bullpen session, his second in four days. Rangers: RHP Tyson Ross (Thoracic Outlet Syndrome) pitched three innings in extended spring training. He's scheduled to go four innings next Wednesday. Athletics: RHP Kendall Graveman (1-0) struck out seven, one short of his career high set last April, in holding the Angels to two runs in six innings in Oakland's opener. Rangers: RHP Yu Darvish got a no-decision in Texas' opener after allowing four runs in 6 1/3 innings.